You’ve spent hours in rehearsals refining your music… how can you make sure your performance complements what you’re doing? Take a long lunch with award-winning lighting designer Clyde Sheets to explore lighting design for music. Sheets, who is himself a musician, and has designed for operas, musical theater, and top new music ensembles like Bang On a Can All-Stars and Eighth Blackbird, shares his perspective and expertise. Get grounded in the essentials of lighting design, and build your understanding of how and where creative lighting and scenic design can play an integral role into the presentation of your music. Participants will build a foundation of technical knowledge and hands-on experience with the C4NM lighting setup. This base of information will help artists bring an advanced sensibility to lighting their performances in venues small and large. Clyde Sheets is a lighting and scenic designer, musician and educator. His designs have been seen in works for Theatre, Ballet, Opera, Musical Theatre and Contemporary Dance. 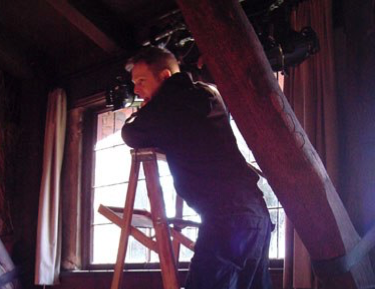 He has taught Dance lighting and production at Mills College in Oakland, Ca. and was the Production Manager and Lecturer for the San Francisco State University department of Theater Arts. Clyde’s design work earned him an Isadora Duncan Dance Award in 2006 for the lighting and scenic design of Deborah Slater Dance Theatre’s Hotel of Memories at CounterPulse in San Francisco. His lighting design for Lizz Roman and Dancers Blue Floor Reflections was accepted by the USITT Emerge exhibit for the Prague Quadrennial in 2011. He was also a participating lighting designer at the Quadrennial. He graduated with honors with an MFA in Design and Production from San Francisco State. As a founding member of The Mad Dog Theater, the ground breaking San Francisco band, he wrote and performed original rock musicals, winning back to back Whammie Awards from the SF Weekly in 1990 and 91. CS can still be seen singing with MDT alum R. Gimbo. He is also a DJ, creating sound scores for modern dance concerts with cellist Alex Kelly and DJ/Beat Master Jerome Lindner. Clyde Sheets brings emotional perception, musical rhythm and theatrical craft together to get to the heart of the collaboration between designer and artist, artist and audience. His approach has fostered many long term artistic relationships and years of beautifully perceptive work. This workshop is supported in part by the San Francisco Arts Commission.